According to Sahara Reporters, Nigeria’s upper legislative chamber broke into an uproar yesterday with some members threatening President Muhammad Buhari with impeachment, and Dino Melaye threatening to ‘impregnate’ Remi Tinubu, the wife of the All Progressives Congress (APC) National Leader. Shortly after commencement of a plenary session, some Senators called on their colleagues, led by Senators Suleiman Othman Hunkuyi (APC Kaduna North) and Kabir Marafa (APC Zamfara Central) to sheathe their sword and withdraw the petition that had led to the criminal prosecution of Senate President Bukola Saraki and his Deputy, Ike Ekweremadu. The Executive Session, which was chaired by Saraki, also reminded the Senate that a committee led by former Senate President David Mark had been set up to “reconcile” members. Curiously, Mr. Mark stood and said he was not informed that he chairs such a committee and that he didn’t know any members. He was simply told to do his “work”. Shortly after that, Senator Dino Melaye (APC Kogi West) said in his remarks that the Attorney General of the Federation, Abubakar Malami, must be brought before the Senate to be thoroughly grilled and humiliated for charging the Senate leadership with forgery in court. Mr. Melaye called on the Senators in attendance to fight the presidency to a standstill. In his rant, he issued a wide variety of threats. Recognized to speak, Senator Remi Tinubu (APC) Lagos Central said the Senate should not be reduced to a kindergarten where Senators could just issue childish threats, and called on Senators to close ranks and seek reconciliation amongst its members. That was when Melaye flew into rage, calling her names. “I will beat you up on this floor and nothing will happen,” he threatened. The statement caused a commotion on the floor as Senators in her support gathered to protect her. 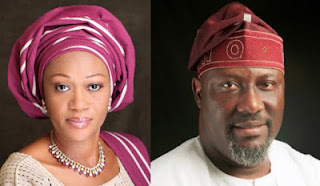 Senate Presient Saraki nodded as Melaye called mrs. Tinubu unprintable names according to Senators who intervened to save her from the rampaging Melaye. A source said there had been a series of meetings at the home of Senator Aliyu Wamakko (APC, Sokoto) to plot a total onslaught on President Buhari in the coming days. The rancor between the Senate and the Presidency is expected to escalate leading to a summons to the new Inspector General of Police who will be forced to declare AGF Malami wanted if he refuses to show up at the Senate from there it was gathered that Senators opposed to Buhari would start impeachment proceedings against him.